Though this problem seems complex but, the concept behind this program is very simple; display the content from the same file you are writing the source code. The output of this program is the location of this C programming file. 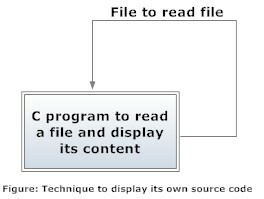 This program displays the content of this particular C programming file(source code) because __FILE__ contains the location of this C programming file in a string. Measuring Time Logic Puzzle You are given with two ropes with variable width. However if we start burning both the ropes, they will burn at exactly same time i.e. an hour. The ropes are non-homogeneous in nature. You are asked to measure 45 minutes by using these two ropes. How can you do it? Please note that you can’t break the rope in half as it is being clearly stated that the ropes are non-homogeneous in nature. All you have to do is burn the first rope from both the ends and the second rope from one end only simultaneously. The first rope will burn in 30 minutes (half of an hour since we burned from both sides) while the other rope would have burnt half. At this moment, light the second rope from the other end as well. Where, the second rope would have taken half an hour more to burn completely, it will take just 15 minutes as we have lit it from the other end too. write a query that will fetch all columns for every row in the table.